We live in a digital age. In photography, digitalization has also lead to democratisation. The vast majority of people carry a cell phone camera with them all the time. Every day, millions of photos are made, shared on the internet, displayed on screens and viewed on monitors. We take or make an image, maybe put a filter over it, watch it get likes, and move on to the next one. We consume the works of others, rapidly clicking through profile pictures, photo galleries and news sections. We have become so accustomed to the ubiquity of photographs that we rarely look at them in much detail. We have seen almost everything already, and we can easily be present anywhere via our devices. Cameraman Anatoly Rudakov has portrayed the world in all its facets for decades. For TV documentaries, he has traveled to remote areas, narrating stories with his recordings. In "Aquamarine", he now breaks with everything that was important in his previous work and creates a new narrative life — which means a reversal of the permanent availability of the flood of digital images, without artificially distancing himself from it. Rudakov has his photographs interlaced on a framed flat screen in a finely tuned rhythm. "60 pictures in 60 minutes" is reminiscent of a painting, but is not a classical exhibition piece. The video installation takes time for itself. Time that digital art works in particular hardly ever get. In order to understand this video installation, it takes time. They do not spend so much time. And few people frame such video works. The artist brings to the museum what is theoretically found everywhere — but he does this in such an unusual way that it challenges the digital image itself and our perception of the digital image. Rudakov composes unmoving pictures of moving pictures. His fine-tuned photo sequences form a work of art, one which, in the individual details, points to a larger whole. Each image conveys an individual mood for itself. The image change leads through these dense atmospheres like waves, which gently wash a beach in their own rhythm. It is not without reason that Rudakov deals with the topic of water in his work. Water in motion, and in different colors, landscapes, and moods. In rivers, in the sea and in lakes. On the Côte d'Azur, in Moscow as well as in Bavaria. Ultimately, the water in us, human beings. It is nothing less than the foundation of our existence, a notion Rudakov addresses in his work. Rudakov made the recordings on his journeys over the past five years. He uses a special technique to break with photography as a means of concrete fixation. With the "Intentional Camera Movement" (ICM), Rudakov deliberately refrains from sharp shots, and his movements and the surroundings are transferred to his photographs. They, like their theme, seem to always flow, and remain uncontrollable. Rudakov represents reality as if it were reflected on a surface of water. The viewer lingers before this reflection — the framed blur on the big screen makes invites the viewer to look more closely, to pause and, in turn, to reflect. The artist experimented for over a year on the project, searching for the right way to tie up his images toshow at the same time to separate one image from another. Finally, he had a special computer program written, so that a fascinating effect accompanied the change of the water photographs. In his video collage, one shot triggers the other by flowing from the top of the screen, the colors of the following photo overlapping the previous one, entering into the image and superimposing it abstractly. The transitions between the images are always puzzles. The forms of the new image gradually materialize out of the stream. It is as if the flat screen itself had become wet canvas, as if it might run down and reveal a new work of art. The aesthetics of Rudakov's digital flood of images becomes more clearly manifested with every new photograph. From the many different viewing angles and moods of the 60 pictures, there arises an intoxicating overall composition. They are lyrical images that make us feel something, rather than simply look at an object on display. They enable us to tell a story together — a story that can only be discovered for ourselves A story that tells of both the individual and of us all. Slowly, very slowly the names of five cities appear on the black screen of the monitor. And even slower a trickle of gleaming golden honey starts to flow over the writing from the top. More and more of it covers the dark background, but then it becomes lighter and it seems to glow. Gradually architectural shapes can be distinguished within this mass of light and color. We can make out arches; an antique building … and then the Roman Colosseum slowly appears in the dusk light. This is the introduction to a 60 minutes video and it couldn’t be more exiting. We are not allowed to dwell on the Colosseum for long, as in due course a trickle of liquid starts running down the screen again; soon it covers the whole width with its color. This time it is blue and cold, like glutinous water. The features of a face slowly appear and the contours of a head take shape. It is the head of a bronze statue belonging to the Roman emperor Augustus that is placed at the Via dei Fori Imperiali. The performance has begun. Rome is the city we are looking at now, it is one of the five portrayed cities of this video collage. We are shown very personal impressions that Anatoly Rudakov has recorded in his pictures while roaming the cities of London, Berlin, St. Petersburg, Paris and Rom. As a photographer he is a genius in capturing the atmosphere of a cities architecture that only really comes to life through its magic mixture of light and movement. Rudakov has composed a video from a selection of his photographs. He worked as a cameraman for three decades and in this video he has chosen to focus on the methodical work of film production. In this film moving pictures reach a state of art only through his camera work and his editing. The artist has a commanding knowledge of these tools. His video collage works with quickly changing contrasts, wide angel versus close-ups, hard versus soft, light versus dark. The direction of the video is done by the motives themselves with their enormous vitality. Compression or ambivalence, pausing and accelerating, even euphoria and dreariness, all these features of a city are shown. None of the pictures remind us of tourist attractions, even if we see monuments like the Colosseum, the Eiffel Tower or the Hermitage. The sequence in which the cities are presented is distinctive but not in any way political; it is the pulse of everyday life. The rhythm of the changing pictures can not only be compared to the continuous flood of images we get swamped with daily through current affairs, but also of sudden changes that have an impact on us. While the author is watching this video in the artist’s studio, the news comes in from Russia that a terrorist attack has taken place in the St. Petersburg underground. At the same time the motive on the screen is covered with colored liquid, as if it were the curtain of a theatre stage that is slowly falling down from the top edge and then it makes place for a completely new scene. The style of the pictures is supposed to remind us of painting. The artist has an incredible gift of showing up structures that one doesn’t easily see, just looking at an object briefly. These structures can be the ornamental lines of squares and buildings, the wavelike commotion in a crowd or simply the depth of a detail. This is part of the mystery, because every time we decode a motive, it is a new discovery for us. Parallel to this video another video sequence was created that focuses on landscape. It is structured in the same method. Here the scenic aspects are of an even greater importance. The atmospheric pictures of all four seasons shine in amazing colors and show a great poetic and emotional potential. Especially the very artistic transitions within both films have a close relation to painting. The overflowing pictures take the part of the color that has to fill the canvas. Over and over again colorful pixel nets cover the displayed images and produce new pictures. Rudakov also likes to present his digital work like canvases in traditional wood frames. The succession of the changing pictures has a strictly determined rhythm. It never lasts longer than one minute from the time one image shows up bit by bit on the screen until its complete appearance. It is then slowly infiltrated by the following picture and then it disappears gradually until it is gone completely. This rhythm reminds us of the turning of a film reel. The artist’s description is brief: 60 Images in 60 Minutes. This guarantees the dynamic concept of the film and also keeps it under control. Even though one could stop the video at any point, one of its main features is exactly this time dimension. At one point the last picture fades away and the screen is blank again. Anatoly Rudakovs digital show is an incredibly esthetic experience between photography, painting and film. NTERNATIONALE KUNST HEUTE is a published collection of current contemporary international artists with a professional art review on the work written by Dr. Ingrid Gardill (in german language). The art historian Nadezda Voronina interviewed the fine art photographer Anatoly Rudakov for the russian online magazine ART ELECTRONICS and asked about his inspirations and influences, his career and technique and how a photographers life develops in the current time. An explanation about his statement "my art is like a black-and-white film: you like it or you hate it", more deeply honest answers and the whole interview can be found in russian on ART ELECTRONICS website: www.artelectronics.ru! The english version of the interview will be published here soon! Chased Magazine is an online magazine and art and people showcase specialising in contemporary art, design, literature, architecture, as well as exhitbitions and events in Berlin. In the last issue of the German art magazine "Kunnst" one of my pictures was chosen and featured in an article about the Berliner Liste. Nice work! Anatoly was featured in the september issue of Cult, a munich based magazine on art and literature. 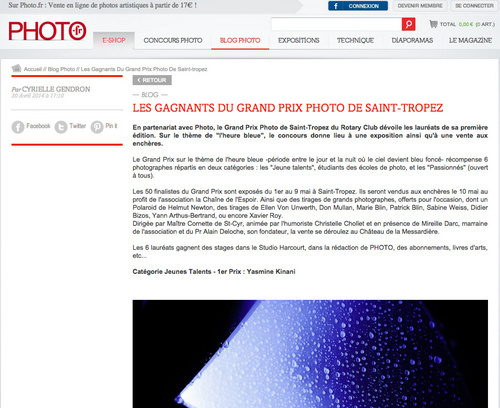 Being on of the finalists at the Grand Prix Photo St. Tropez, Anatoly was mentioned in an article about the festival in the renowned french photo magazine photo.fr. City Symphony is the name of the second catalogue published by Anatoly Rudakov in April 2014. Focusing on the beautifcul cities all around Europe. In spring of 2014 Anatoly Rudakov published the catalogue "Landscapes" focusing on his work of the European nature. Written by Dr. Barbara Rollmann-Borretty, 2014. Anatoly was interviewed by the russian culture and science magazine nauka i zisn. The interview primarly focuses on his work and the way he sees the world. Title: My digital impressionism. About a man with a camera.